In a two-pronged attack on the Congress over the 'Hindu terror' tag, Prime Minister Narendra Modi and BJP President Amit Shah on Monday accused the opposition party of trying to defame the community, saying it is a "sin" to link peace-loving Hindus to terrorism. 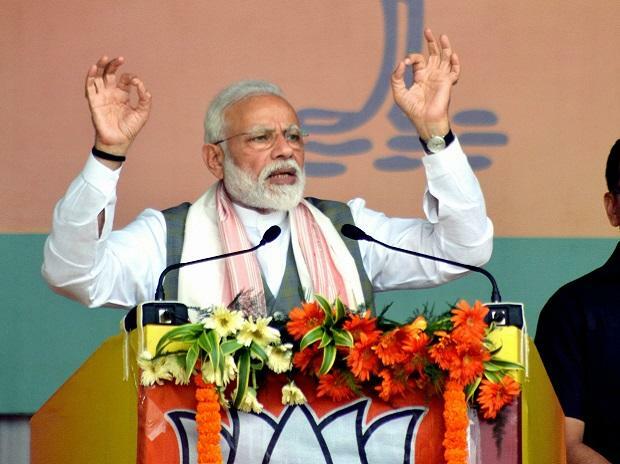 The Hindus have now woken up and the country has decided to "punish" the opposition party, Modi said launching the BJP-Shiv Sena alliance's Lok Sabha poll campaign in Maharashtra at a public rally in Wardha. "The Congress tried to stain crores of the country's people using the term 'Hindu terror'. Tell me, weren't you deeply hurt when you heard the term 'Hindu terror'? Is there a single incident in the history of thousands of years of Hindus engaging in terrorism?" Modi thundered at the rally. He also asked the people whether they would forgive the Congress for committing the "sin" of linking peace-loving Hindus to terrorism. The prime minister said the Congress was very well aware now that the country has decided to 'punish' it. "Some leaders are shying away from contesting polls (in the first place). Those, whom it (Congress) called terrorists, have woken up," Modi said. "They linked peace-loving Hindus to terrorism... they are scared now to contest election from constituency where majority population dominates...they are forced to go where majority (Hindus) are in minority," he added. Shah took on the Congress on the 'Hindu terror' tag while addressing a rally in Paralakhemundi in Gajapati district in Odisha which falls under the Berhampur Lok Sabha constituency that goes to polls in the first phase on April 11. "Rahul (Gandhi) Baba's party attempted to link the Hindu community with terrorism. It was a bid to defame Hindus across the world," Shah said. Tewari said Modi should talk to his ministerial colleagues and he would know who has defined 'Hindu terrorism'. "It is unfortunate that the prime minister is trying to to speak a lie to deflect the attention from his own failures," Tewari told a news conference in Delhi. "As far as Congress is concerned, the Congress always believes that terrorism does not have any religion or caste and it needs to be fought.